Walk, to honor those who cope with mesothelioma. Bike, to show your support for the courage you see in every mesothelioma patient. Kayak, to celebrate the lives and families affected by mesothelioma cancer. This year, there are more opportunities than ever to show your support and bring attention to Mesothelioma Awareness Day. From New York to Illinois to Virginia, events will take place throughout the country for an entire week with the goal of increasing awareness about mesothelioma cancer and raising funds for medical research. Held every year on Sept. 26 in the United States, Mesothelioma Awareness Day was first organized by a group of Meso Foundation volunteers in 2004. For nine years the Meso Foundation has continued to organize and promote Mesothelioma Awareness Day events. The majority of these events raise money to fund research grants made available through the Meso Foundation. For example, Miles for Meso, a nonprofit that organizes foot races held throughout the United States, has raised more than $160,000 since 2009. 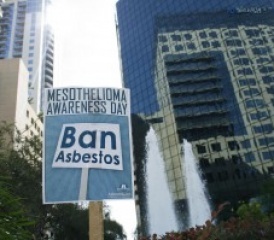 The increase in events celebrating Mesothelioma Awareness Day is making it easier than ever to raise awareness about the asbestos-related cancer. Even if you can’t attend any of the following events, you can visit our Facebook page to participate in a Virtual March for Meso, which was a great success last year. The 3rd Annual Kayaking 4 Meso kicks off in Schuylerville, N.Y, with a 16-mile paddle, and continues through Stillwater, where a second launch is available for those interested in a three-mile paddle. At the finish point, festivities will celebrate participants and people affected by mesothelioma. Last year, more than 130 kayakers competed in the event and organizers are hoping for 200 paddlers this year. The 5th Annual Miles for Meso Alton in Illinois takes place 30 minutes outside of St. Louis and has raised $100,000 since its inception in 2009. The 2012 race alone raised $25,000 for the Meso Foundation. The race attracts elite runners with cash prizes for the top 10 finishers. ROD’s 4th Annual Benefit for Meso in Eleanor, W.Va., starts with a 5K run/walk in the morning. The benefit follows with food, live music, entertainment, raffles and family events. The Bruce A Waite Miles for Meso 5K Run/Walk in Ontario, Ohio, will begin at 2 p.m. and the first 200 to register will receive a Miles for Meso T-shirt. The 4th Annual Dog Walk for Meso in Phelps, N.Y., unites our furry friends with a good cause. The annual dog walk honors Dr. John Wright and begins at 1 p.m. at Ontario County Pathways. Gather at Rockefeller Plaza in New York City, N.Y., to garner national attention for mesothelioma on the “Today” show with signs showing your support. Can’t get to New York? No mesothelioma events planned for your locale? Join our Virtual March on Facebook! We’ll also have a nifty badge that you can easily add to your profile photo to raise awareness. With just a couple clicks, a small logo will appear in a corner of your Facebook profile photo. Patients, families and doctors will gather in New York City to attend the one-day conference Malignant Mesothelioma: Knowledge Is Hope. Leaders in mesothelioma research and treatment, including Raja Flores, M.D. and Harvey Pass, M.D., will speak and answer questions during panel discussions. Topics of discussion will include mesothelioma treatment, current clinical trials, genetic research, social support for patients and caregivers, and legal implications. The 4th Annual John Pavlick Miles for Meso 8K & Family Fun Run in Fairfax Station, Va. features a timed 8K race and a 2K run for families. This annual event honors John Pavlick, who was just 60 years old when he was diagnosed with mesothelioma. Flywheel Sports Rides to Cure Meso in New York City will honor George D. Devine and proceeds will benefit the Meso Foundation. A Craft Show and Benefit for Meso will take place in Roseville, M.N. from 11 a.m. to 5 p.m. The event will feature a raffle and bake sale, in addition to craft vendors. Proceeds will help local mesothelioma survivor, Vicky LeVasseur, cover medical costs for doctor visits and chemotherapy treatments. An off-road championship race to benefit the Judith L. Lagana Memorial Grant for mesothelioma research will be held in Millville, N.J. The event will also feature food, retail vendors and family entertainment. Snag your sneakers and join one of the foot races. Dust off your bike and ride to raise awareness. Rent a kayak and paddle your way to a cure. No matter what way you choose to increase awareness this year, you’ll surely be making a difference. Share your efforts with us and the rest of the nation on Facebook this Mesothelioma Awareness Day!